Understanding local contexts is critical to designing and implementing effective approaches to improve nutrition through agricultural programs. 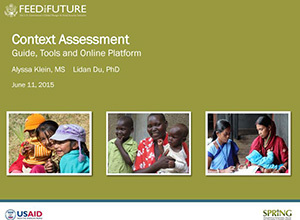 While many tools have been developed to help implementers with context assessment, knowing which tool is most appropriate for particular aspects of programming can be a challenge. SPRING has developed an online interactive guide to help designers and implementers of agriculture-nutrition projects understand which context assessment tools can be most effective at various points along the Pathways from Agriculture to Nutrition. The guide is intended to inform multisectoral program design by leading program planners through a process that identifies and prioritizes components of over 50 relevant, existing context assessment tools that meet planners’ needs. In this webinar, SPRING Food Security and Nutrition Specialist, Alyssa Klein and Research Advisor Lidan Du demonstrated how the guide helps position agriculture and food security interventions to improve maternal and child nutrition. As part of this webinar, Amy Deptford, Nutrition Officer at Save the Children, UK showcased how practitioners can use one of the tools in the guide. The Cost of the Diet (CoD) tool estimates the amount and combination of local foods needed to provide a typical family with a diet that meets their average needs for energy and recommended intakes of protein, fat, and micronutrients. In addition, the tool helps to identify the minimum cost and the affordability of such a diet, as well as whether a nutritious diet can be achieved using locally available foods.